5mg × 5 strips $ 6.99 $ 34.95 Buy Now! Ovulation is the process of egg’s release from the ovary. This egg then passes into the fallopian tube, where it is ready for fertilization. For a successful pregnancy, the egg must fertilize within 24 hours of its release. Just before ovulation, the body produces the LH surge (i.e. large amounts of Luteinizing Hormone). Usually the hormone surge happens in the middle of your menstrual cycle. This LH is responsible for triggering the process of ovulation. 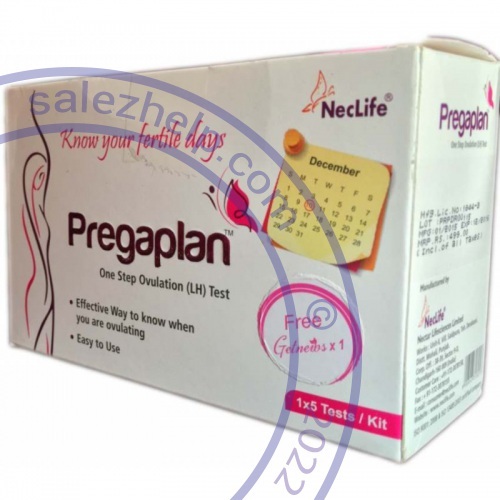 Pregaplan Test is a complete system to assist you in predicting the time of your peak fertility levels (i.e. the time when you are most likely to ovulate). During this time of maximum fertility, chances of conception are highest for the woman. The Pregaplan test detects the LH surge in the urine sample, indicating the occurrence of ovulation in the next 24 to 36 hours. What is Ovulation test needed for? A woman’s body works according to a certain cycle, with a 2-day special fertile window. These two special days are the period of the woman’s maximum levels of fertility, when she has the highest chances to get pregnant. Many women experience ovulation around the day 14 of their cycle. However, this is not an established rule for every woman, and due to a number of reasons this process of ovulation can also take place earlier or later for different women. Therefore, this is one important reason why women go for ovulation tests, in order to chart one’s fertility levels. To determine when to start testing, you should do a little calculation first. Begin by determining the average length of your normal cycle, which could vary anywhere between 20 to 45 days. Start counting from the first day of your period (i.e. the first day of bleeding and spotting) and stop the count on the first day of your next period. This becomes the length of your cycle. If this length is different each month by more than just a few days, then simply go with the average number of days over the last three months. Once you determine the average number of days for the length of your cycle, and then refer to the cycle chart to determine which day of your cycle you should begin testing. A menstrual cycle has three phases. Each phase produces different hormones with distinct set of functions. The first is the follicular phase that begins on the Day one of the cycle. The first day is the full day of your menstrual bleeding when the uterine lining begins to shed. If the egg fertilization does not happen during the previous cycle, the body must shed the lining of the uterus to prepare itself for the next cycle. This phase lasts for 3-5 days, but can be even more or less. Immediately following the shedding of uterus lining, the body begins to prepare for the cycle’s next phase, the ovulatory phase. However, before this phase begins, the hormones prepare the body for ovulation. The pituitary gland releases two hormones, Follicle Stimulating Hormone (FSH) and Luteinizing Hormone (LH). The FSH stimulates a follicle to grow and the inside egg to ripen. LH stimulates the follicle to manufacture and secrete estrogen. When the estrogen amount reaches a certain level, it causes the pituitary gland to release LH surge. 24-36 hours post the LH surge, the follicle bursts, releasing the completely ripened egg into the fallopian tube. This egg release is what we term as ‘Ovulation’. The redeemed egg now floats down the fallopian tube, making its way towards the womb. If the fertilization of egg is not complete, it will survive for not more than 24 hours. The day of ovulation and the one before it are the two most fertile days of a woman’s cycle, when the chances of her getting pregnant are the highest. LH surge always precedes ovulation so detection of this hormone is significant for the prediction of the two special days. The final phase of your menstrual cycle is the ‘luteal phase’. It follows ovulation. In case of egg fertilization, the body produces hCG that any pregnancy test can easily detect. The follicle, where the egg bursts, starts shrinking and releasing progesterone and estrogen. Progesterone prepares for the fertilized egg, by building the uterine lining with the increase in blood vessels. The increase in the production of progesterone maintains the pregnancy. hCG hormone assists in continuing the production of progesterone and estrogen. In case, the egg fertilization does not take place within 24 hours, the production of progesterone declines gradually. When there is not enough progesterone, after around 11-14 days, the menstrual cycle begins again. Detection of the LH surge can predict when you can ovulate. The most fertile time of your cycle ranges in between the next 2-3 days beginning your surge, with a peak fertility level reaching during the first 36 hours. Getting intimate during this time has the maximum chances of you being pregnant. Therefore, timing is one of the most important factors, while one is trying to conceive. What is the Working Mechanism of Pregaplan Ovulation Strip? Pregaplan Ovulation Test Kit works on the basic principle of detection of Luteinizing Hormone, by visually interpreting the color development on the device. The test region of the membrane clogs the anti-LH antibodies, whereas the control region locks-up the anti-mouse antibodies. While testing, the urine sample reacts with anti-LH antibody, conjugated to the colored particles and pre-coated on the sample pad. The reacted mixture migrates via the membrane, and interacts with reagents on membrane. If the sample has sufficient amount of LH, a colored band forms in the test region. This colored band in membrane signifies a positive result. The display of a colored band in control region indicates a procedural control, which is a sign of addition of proper volume of specimen. One should not use the first morning urine sample as LH synthesis in the body takes place early morning. Therefore, it will not show up in urine until later in day. The most suitable time for collecting samples is anytime between ten in morning to eight in evening. Collect samples at the same time every day. Lessen your liquid intake almost two hours before sample collection. This is because diluted urine samples might prevent the test from detecting the LH surge. Keep the Pregaplan plan test device, the urine sample and the control solution, all at normal room temperature. Open the test kit to find the ovulation device and the dropper. Draw about 3 drops of urine sample into the dropper. Dispense it properly on the device cassette. Now wait for the colored line to appear. You may read the results in around 10 minutes. Do not decipher the results after 15 minutes. Positive: The result is positive if two color bands are visible. The test band color line (T) is equal to or darker than the control band color line (C). A positive result means you will ovulate in the next 24-48 hours, and that is the most probable time to conceive. Negative: The result will be negative either if only one color band appears in the Control region, or if the test color band is lighter than that for the control band. Invalid: The results are invalid if either there are no visible bands, or there is a test band without the control band. In any of these cases, you should repeat the test with a new kit. The Pregaplan test contains a mechanism for procedural control. A colored line in the Control region (C) is an internally controlled procedure for confirming sufficient volume of specimen and adequate wicking of the membrane. This also proves using the correct procedural technique. Positive results indicate the LH level in urine as sufficient to begin ovulating in the next 24-36 hours. Negative results imply no detection of LH surge, a case in which you should continue your daily testing.